The Galway hurlers will have to step up their collective intensity, work rate, first touch and efficiency in front of goal if they are going to regain the Bob O'Moore Cup for 2018 in Sunday's Leinster final replay against Kilkenny at Semple Stadium (3pm ). The current champions were well off the pace up front last week compared to last season, and some of their decision making was a bit suspect at times. Despite that, they still led by three points going into the last few minutes and with a bit more composure, better decision making and accuracy, they could have squeezed a narrow win but instead were forced into a 0-18 draw. However, based on what they produced last Sunday, a draw could prove a positive result. It gives the entire squad an opportunity to get back to real championship intensity and lets them know what will be required if they have aspirations of achieving two in a row, in either Leinster, or the All Ireland. Being overwhelming favourites and having beaten Kilkenny handily enough in the round robin series in Pearse Stadium may have played a small part in the timid enough display. As Micheál Donoghue pointed out after the game: “Our boys are human. Over the last number of weeks people were getting carried away." Kilkenny, having been regular winners of the Leinster title over the past few decades, were never going to rock up to Croke Park as cannon fodder for Galway. 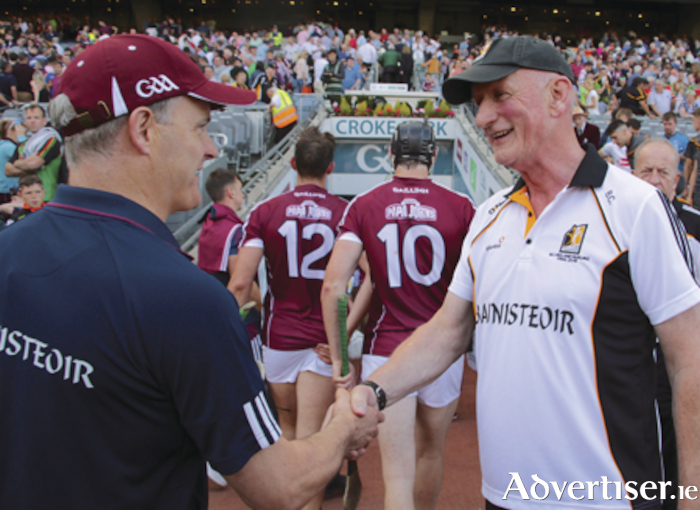 Manager Brian Cody is a really serious competitor and Kilkenny have only lost one of the 18 Leinster finals in which he has been involved, and that was in 2012 when Galway beat them by 2-21 to 2-11. It was obvious from the first ball last weekend that the Kilkenny players were well revved up for the contest and no ball was going to be won easily by any Galway player. The black and amber players looked far more tuned into what was required and focused, whereas the Galway players, especially from the half-backs up, were not as responsive as they needed to be to win a really tight and competitive provincial final. The Galway team management will use this week to analyse last week's contest, ensure the players get rest, and see what tweaks need to be made to try to get a hugely important win in three days' time. The stakes are high - the winners will have a few weeks to target and focus on an All-Ireland semi-final, while the losers will have very little time to get ready for their next game. Will Galway make some changes? A big decision for Micheál Donoghue, Frannie Forde and Noel Larkin is whether to make a few changes up front in an attempt to freshen things up. With Pádraig Walsh so dominant in the air at full-back, the Galway management may be tempted to start big Johnny Glynn at full-forward to see if he can win the aerial duels and use that possession to give a platform for the Galway forwards. Glynn did catch two balls on his introduction and perhaps he merits more game time than he was given last Sunday. Likewise, Brian Concannon and Jason Flynn could also argue their cases for bigger roles, with Flynn coming on in on 70 minutes. There is also the added complication of last night's Leinster U21 final to consider. How some of the U21 players performed in that final against Wexford could have an influence on the Galway senior management's decisions in both the starting line and possible impact substitutions. The bottom line is Galway will need to improve on their performance from last weekend and they are well capable of doing so. Micheál Donoghue and his squad will know that. Plus if a few of the team's forwards could show the stupendous drive, power and will to win their individual battle that Daithí Burke shows, then a win would be much more probable. The Turloughmore man made some superb interventions last weekend with his rob on big Walter Walsh, one of the highlights of the game from a Galway perspective. He is a really tremendous competitor. “Last weekend was the most physical and intense game we’ve had in a long time. In that regard, when it is that intense, you’re going to be put under pressure. Some of our play looked a bit off at times. "However, that game will stand to us. We knew they weren’t going to come to Croke Park and lie down. They worked as hard as we expected them to. I have no doubt it will be the same next weekend. I think for both teams it will bring them on and it will be another exciting encounter next Sunday in Thurles. We are looking forward to it." •The Galway U17s face Limerick next Sunday in Thurles at 1pm in the first round of the All-Ireland quarter-final. Kilkenny are the other team in the group.